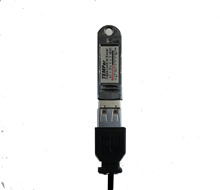 Temperature sensor with 3M USB extension cable. With the unit inserted in the PC then GT-Command automatically adjusts the measurement calculations. temperature . Temperature Field in Settings is gray and insensitive to manual change as long as it is inserted. Should be set up some distance away from the PC, such as high on the wall.